Actress Cassandra Peterson Reprises Her Iconic Role of Elvira in New Zombies Experience “Attack of the Radioactive Thing!” set in a 1950s Creature Feature. Revealing the first official details of Call of Duty: Infinite Warfare Absolution, the third DLC Map Pack for 2016’s No. 1 top-selling console video game in the United States (excluding hardware bundle sales), Call of Duty: Infinite Warfare. The map pack features four new, diverse multiplayer maps, and a new zombies co-op experience called Attack of the Radioactive Thing!, set in a ‘50s era beach town where a government science experiment has gone horribly wrong. Absolution is scheduled to release 6th July, first on the PlayStation Network for the PlayStation 4 computer entertainment system, with other platforms to follow. 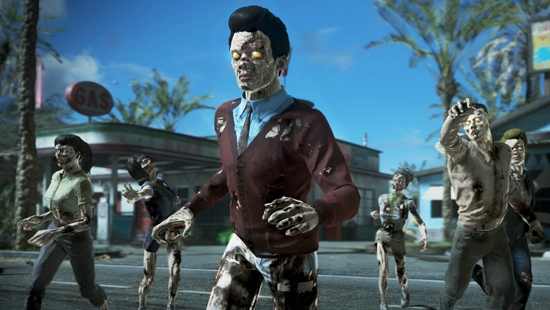 Attack of the Radioactive Thing!, the next action-packed chapter of the Call of Duty: Infinite Warfare zombies experience, once again features the return of Willard Wyler, the enigmatic movie director villain portrayed with voice and likeness by Paul Reubens (Pee-wee’s Big Holiday, Gotham). Wyler has trapped the four protagonists inside an all-new horror film, set in the 1950s and in the style of the Creature Feature films of the era. Players will fight a new array of zombie enemies across a ravaged beach town where a government science experiment has transformed the residents into flesh-devouring zombies and introduced a new biological menace into the city. Additionally, horror movie icon Elvira, played with voice and likeness by Cassandra Peterson (Elvira: Mistress of the Dark, Elvira’s Movie Macabre), will help players survive and give them gameplay tips and side quests with her unique Elvira style. New weapons, traps and more will augment the hallmark Call of Duty action, with Seth Green (Robot Chicken, Austin Powers) as "the Scientist;" Ike Barinholtz (Neighbors, Suicide Squad) as "the Rebel;" Jay Pharoah (White Famous, Saturday Night Live) as "the Soldier;" and Sasheer Zamata (Saturday Night Live, Inside Amy Schumer) as "the School Girl," all making a return from the ongoing story in this all-new experience. Bermuda – A shantytown created around the remnants of a crashed ship, Bermuda allows players to duck, dive, and wall ride from the fish market to the lighthouse in this small to medium sized map that’s been water-wasted and sandblasted. Permafrost – Set within the chill of a frozen city skyline, Permafrost lets players stick to the ground and pick their plan of attack in one of three main lanes. They will traverse the map, moving from street side to train station, and hobo village to wrecked theater house in this small, tight-quarters map. Fore – In Fore, the only thing miniature about this large map is the golf courses players will be fighting in. Fore features great visual variety as players swing around the sights and sounds of areas that brandish magical forests, giant creamsicles, and elevated castle walls. Ember – Located near an old town castle, Ember is a remake of the Modern Warfare 3 classic map Resistance, featuring old world aesthetics retrofitted with modern technology. The surroundings include lava, gallows and a torture room, where players will want to stick close to their teammates. Call of Duty: Infinite Warfare Absolution releases on 6th July 2017 first for the PlayStation 4, with other platforms to follow.